Explanation: The Russian Proton rocket is the tallest rocket in routine use. First deployed in 1965, the rocket stands typically 40 meters tall, can carry unusually heavy payloads into space, and maintains a high record of reliability. The Proton can be configured to launch satellites into orbit, to carry modules to a space station, and to carry people. The satellites a Proton Rocket has launched include Iridium, GRANAT, and, just last month, Sirius 1. The Proton frequently launched modules that docked with the Mir Space Station. Pictured above on July 12, a Proton rocket launches the Zvezda module which is scheduled to be added as the third major component of the International Space Station next week. 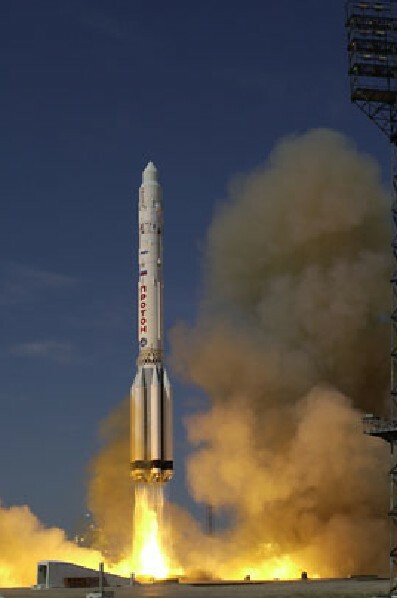 The Proton is launched from the Baikonur Cosmodrome in Kazakstan.